A few days ago, a drone captured this eye-popping video of the world’s worst traffic jam on the G4 Beijing-Hong Kong-Macau Expressway. Blame foggy weather if you like, but physics says it all comes down to a question of density — namely, an unusually high number of people returning to Beijing after a week-long holiday festival. I’ve never seen anything like this, and I live in Los Angeles; the City of Angels frequently tops the list of places with the worst traffic in the country, along with Washington, DC, San Francisco, New York City, Atlanta, Chicago, and even Seattle. Traffic flow is a big problem in most major urban centers. The average US motorist spends 36 hours every year in traffic delays. But China — man, China takes the crown when it comes to insanely congested traffic. 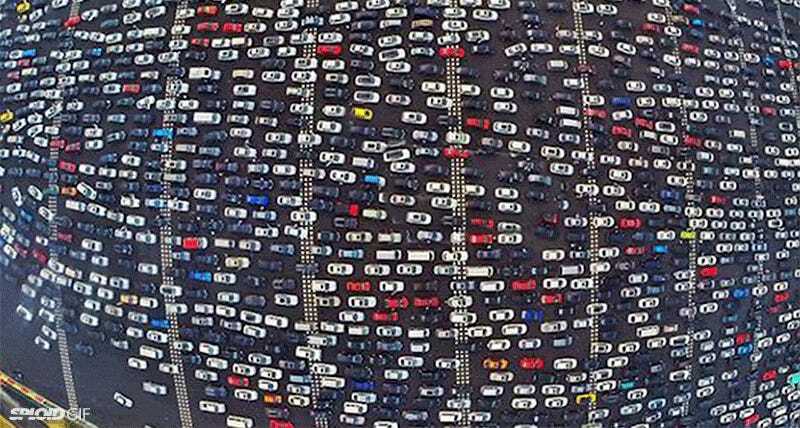 A study last year found that the average Chinese driver spends the equivalent of nine days a year stuck in traffic. Scientists have been studying traffic patterns for years, trying to build mathematical models to devise some kind of solution to keep us all from snapping and turning into Michael Douglas’s rampaging motorist, D-FENS, in the 1993 film Falling Down. One of them is a physicist named Boris Kerner with the Daimler Benz Research Institute in Stuttgart, Germany, who published a seminal paper in Physical Review Letters in 1998. He analyzed data collected from several years of traffic along German highways and found that traffic follows the physics of self organization. When this happens — when all the cars are traveling at close to the same average speed because of the vehicle density on the roadway — they become highly dependent on one another. A physicist might compare the relationship to the correlated motion of electrons in metals, which gives rise to weird phenomena like superconductivity. Highly correlated traffic means that a tiny perturbation — a butterfly flapping its wings, or a single driver braking unexpectedly — will send little ripples of corresponding slowdowns through the entire chain of cars behind him/her. That’s one reason why slowdowns and traffic jams occur most commonly at merge points, especially exit and entrance ramps, or when lanes are closed due to road construction. Or at toll points on mega-highways when not enough booths are open, forcing 50 lanes jam-packed with cars — 50 lanes? WTF, China?!? —to merge down to 20. Granted, so-called “phantom” traffic jams (or “jamitons”) can happen even when there’s no exacerbating factor. It’s a delicate balancing act. There’s a critical threshold for traffic, and once it’s reached, even tiny fluctuations can cause a chain reaction that eventually results in a jam. Eventually you get a “pinch effect” — that frustrating “stop and go” phenomenon, in which you escape one narrow jam only to encounter another a little further down the road, until they all converge into a single wide jam and traffic comes to a standstill. Just something to think about the next time you find yourself cursing at congested traffic. Kerner, Boris. (1998) “Experimental features of self-organization in traffic flow,” Physical Review Letters 81: 3797. Flynn, M.R. et al. (2009) “Self-sustained nonlinear waves in traffic flow,” Physical Review E 79(5): 056113.